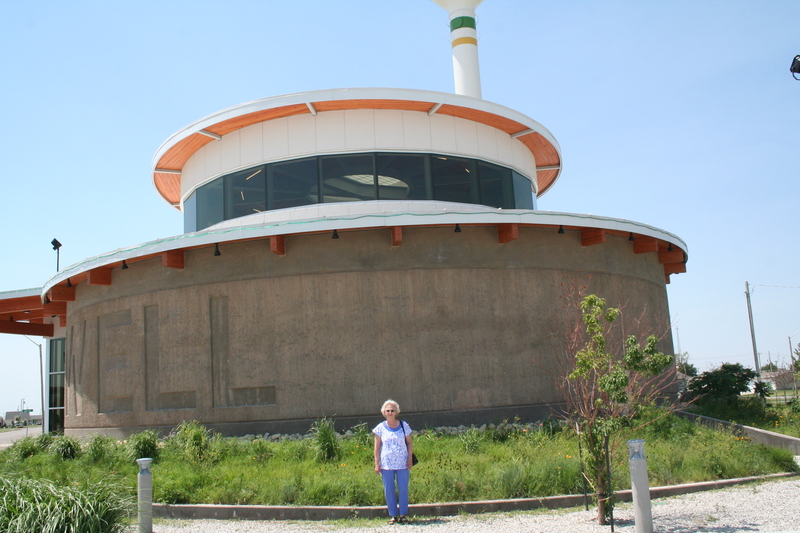 We have never gone through Greensburg, Kansas without stopping at The Big Well – a marvel of early engineering! 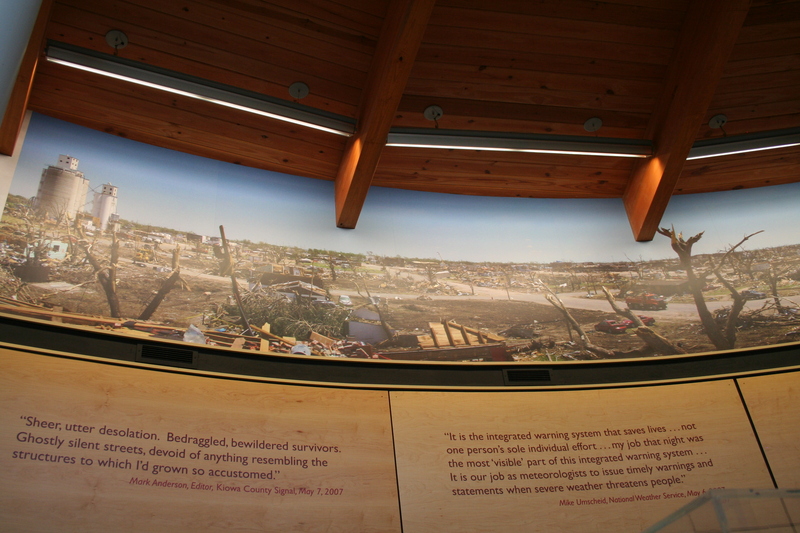 It is the largest hand-dug well in the world and was built by men in the area using picks & shovels, pulleys and ropes. They went to work at sun-up and were paid (fifty cents to a dollar) at sun-down. It came into being due to the need for water for the Sante Fe and Rock Island Railroads and was completed in 1888 at a cost of $45,000. It served the city until 1932. 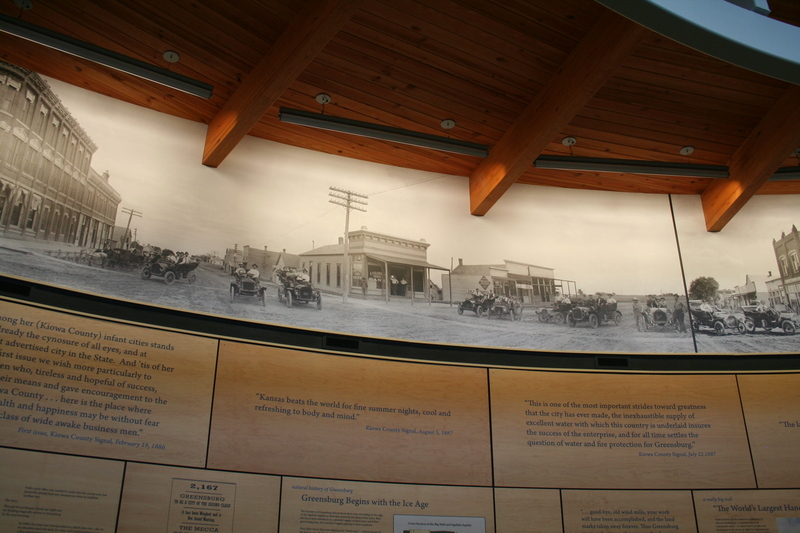 The rock for the casing was brought in by wagon over very difficult roads from Medicine River twelve miles south of town. Dirt excavated from the well was hauled away by the same wagons. The slats in the bottom were opened and used to level the roads to the quarry. Remember when we never used to waste anything? 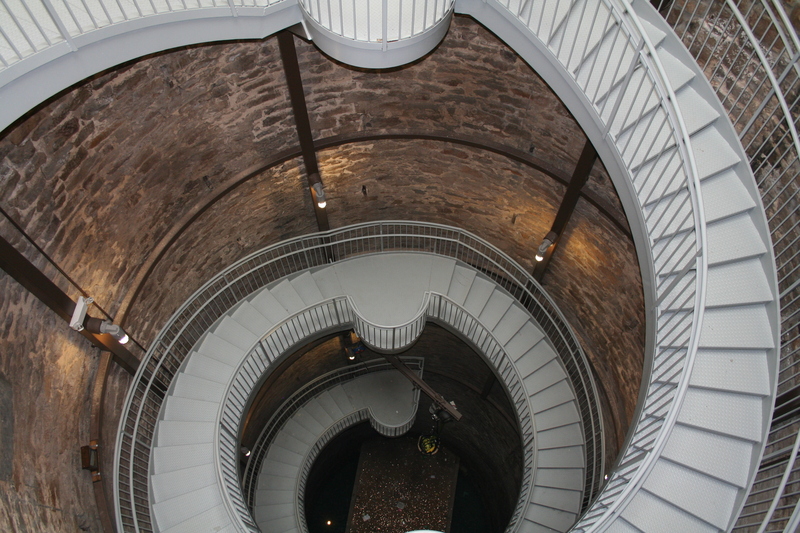 It was 109 ft. deep and 32 feet in diameter at it’s completion. 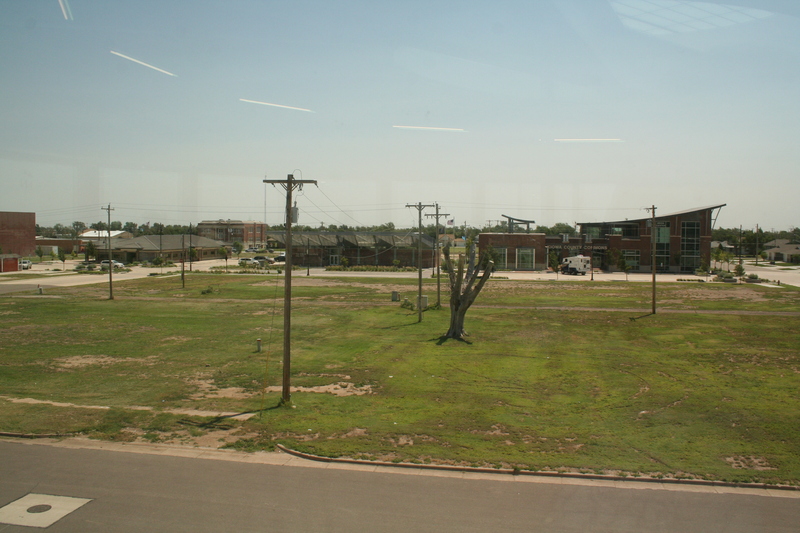 The town was literally destroyed by a tornado on May 4, 2007. 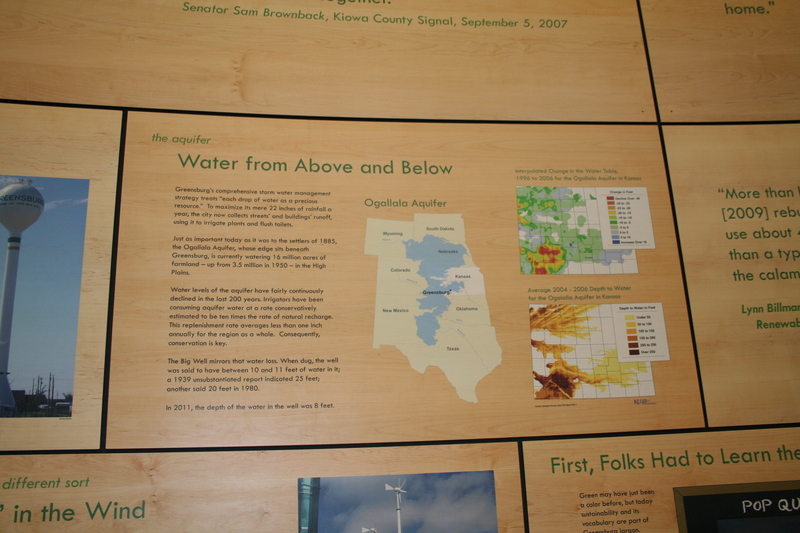 The new Big Well Museum re-opened May 26, 2013 once again allowing visitors to view it. A very elaborate spiral stairwell will once again take you to the bottom if you wish to do that. Leaning over looking down at the bottom was enough for me! The structure is circular in keeping with the round well. 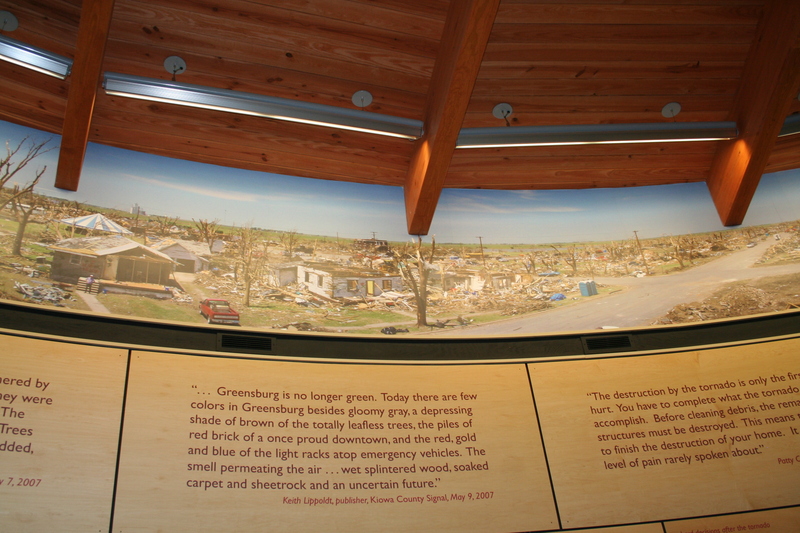 Many photos circle the interior showing the early town as well as the devastation of it after the tornado. It is almost unbelievable how it leveled that place! It is now beautifully restored. Naturally, pretty much everything is brand new – I call it the newest old town in America. If you’re ever through Greensburg, be sure and stop to see it. I remember seeing it when we were kids. It was amazing!